Have you not cried at your desk yet today? 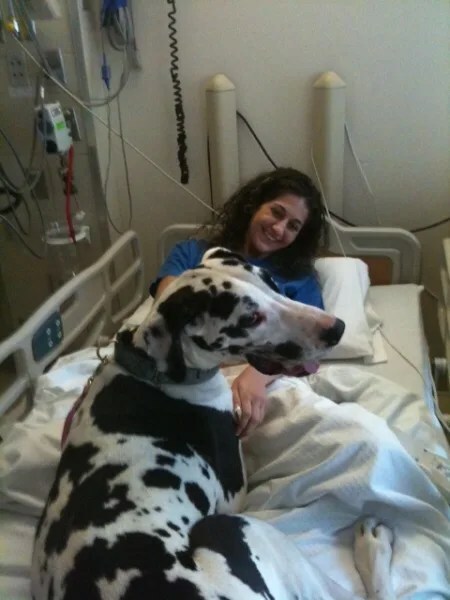 Let me help you change that with this story of an epileptic therapy dog who was narrowly saved from being euthanized and now visits hospices, hospitals, and women’s shelters to bring some happiness to people in unimaginably difficult circumstances. Belatedly, I can also report that I successfully completed my April poem-a-day challenge! I had to write five (five!) drafts the last day to catch up, but I did it. Now, after a little breathing room, the task will be to go back and see which pieces are worth revising and, eventually, submitting. Not all of them, certainly, but I think a good few will meet that bar. It was sometimes difficult to squeeze in a poem, but overall it was easy enough to keep writing as a daily habit that I have a new perspective on what I can fit in a day. I won’t try to keep writing a draft every day, but I will shoot for one new one each week. It felt good to drop back into a flow of words and see what came out after I’d exhausted all of my easy tropes.